The Spiritual Director of the Adoration Ministry, Enugu Nigeria, Rev. Fr. 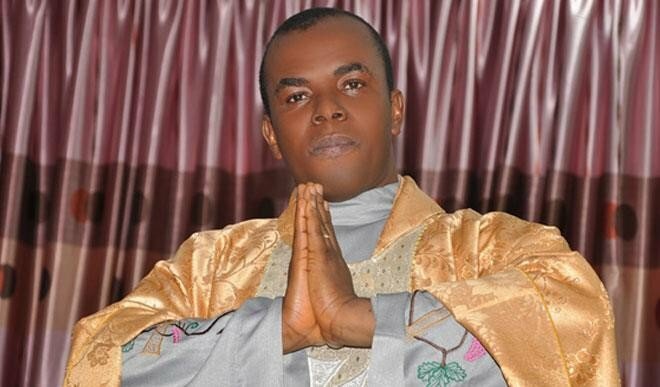 Ejike Mbaka has predicted doomâ€™s day for the presidential candidate of the All Progressives Congress, APC, Muhammadu Buhari and the Presidential candidate of the PDP, Alhaji Abubakar Atiku. He said none of them would win, but failed to mention the eventual winner. Mbaka said it was bad and scandalous before the Holy Spirit that after their prayers on Adoration altar made Buhari the President, he has refused come back to thank God. He also narrated how his ministryâ€™s prayers saved Buhari from deadly sickness in 2015. He also berated Atikuâ€™s running mate, Mr. Peter Obi. Though he said they had always supported Obi, he stated that Obi had not done anything for his church. He said God would bless Governor Dave Umahi of Ebonyi State and Ifeanyi Ugwuanyi of Enugu State and grant them second term for what they had done for him. Fr. Mbaka curiously withheld Obiâ€™s blessing and said he would only release it after Obi had done a project for them. Using Umahi as an example, Mbaka said: â€œUmahi donated 1,000 bags of rice and 1,000 tubers of yam to us, but it meant nothing to me until he handed N10 million cheque to me and promised to build a project for the ministry. This is the type of gesture we require from Obiâ€, he said.